I think having an heirloom-quality chessboard is a must for every home. Seriously, I do. Not only is chess a great game, a fine chessboard looks classy set up in a den, library, or family room. 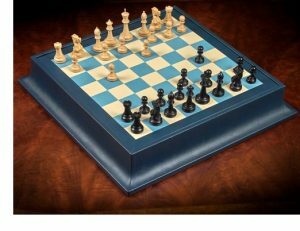 I like the Marine Leather Chessboard I found from the fine folks at Scully & Scully. Find the Marine Leather Chessboard from Scully & Scully here. See all the great products from Scully & Scully here. Lost Cowboy is powered by	WordPress 5.0.4 and delivered to you in 0.794 seconds using 40 queries.